When we lived in London we lived in an area with a curry house on every corner. However, we rarely ate out at an Indian restaurant because Dharish lived around the corner and her curries could not be beaten. Some of my fondest London food memories are the lavish Indian feasts that Dharish would cook for us and our friends. We still salivate when we think of them even now! 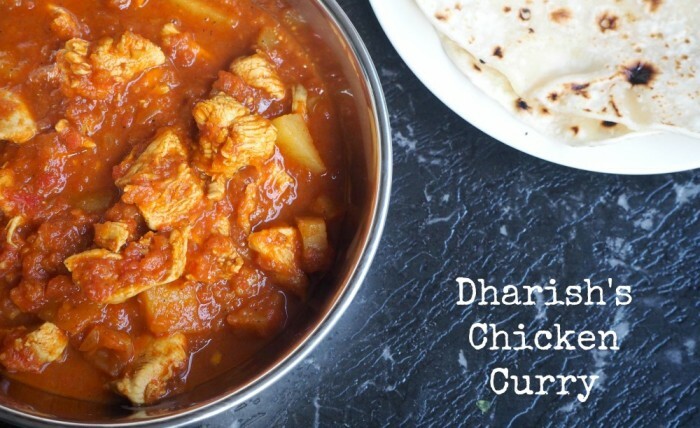 Dharish’s curries are probably some of the best in the Northern Hemisphere and one of the things I miss most about living in London. She really is the Queen of Curries and when we left the mother country, we begged her to give us a recipe or three, so that we could continue to enjoy her recipes down under. Of course, being Dharish, and being fabulous as she is, she happily obliged. We’ve been regularly cooking this curry it’s ever since because it’s quick, healthy and it’s spicy but nicey! Talking of healthy, if you’re all aboard the Weight Watchers or Slimming World train, this curry will see you right, just see notes below. If you like your curry in a hurry, you’ll love this and if you have a Thermomix, check out the conversion here. Fry onions in a large pan until golden brown. Add all the spices and fry for about 30 seconds. Add tomatoes and simmer until soft. Add ginger, garlic and potatoes. Garnish with coriander, if desired.